The UK's City of Culture for 2013 is ideal for incentives, says Christy Wyatt. The spotlight shone on Londonderry - also known as Derry - in July when it was named the UK's City of Culture for 2013. Beating finalist cities Birmingham, Norwich and Sheffield, Londonderry was praised for its strong cultural offering. While the accolade is sure to spark new developments in the area, the Northern Irish city already offers a rich history to be explored, alongside modern event facilities. Ryanair offers regular flights to the City of Derry airport, while Belfast International Airport, about 75 minutes from Derry City centre, serves more than 50 destinations across Britain, Europe, the US and Canada. The Waterfoot Hotel opened last year on the east bank of the River Foyle, within easy reach of visitor attractions. It offers 44 rooms with modern decor and a restaurant. Located within the historic city walls, the four-star Tower Hotel features 90 rooms, an award-winning bistro, a gym and event space for 350 delegates. For a more relaxed event, try the four-star Beech Hill Country House Hotel, set just two miles from the city centre in 32 acres of lakes and gardens. The 27-room venue has three meeting spaces with capacity for 100 delegates, a marquee for 500 and the Ardmore Restaurant. Purpose-built conference venue the Millennium Forum is the largest conference venue in the north west and has capacity for 1,020 delegates. 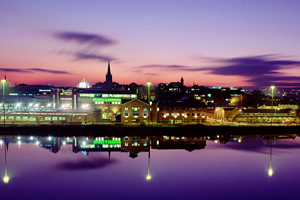 The City Hotel is a four-star property located on the banks of the River Foyle, offering a floor dedicated to conference facilities. Event space includes five meeting rooms and a boardroom with capacity for 450 delegates. The four-star Hastings Everglades Hotel is also situated by the River Foyle and features a ballroom with capacity for 400 delegates, and five meeting rooms for up to 120. VIP groups wanting to explore the city's history should book a guided tour at the Tower Museum. Delegates are welcomed by a string quartet, before enjoying panoramic city views and tours of the museum and ancient city walls, with costumed guides re-enacting historical scenes. At Prehen House, delegates can travel back to the 1700s to explore the legend of Half-Hanged McNaughton. Groups can enjoy a Champagne reception and string quartet performance in the library and a tour of the house, followed by an evening of Bushmills whiskey tasting and traditional music. The Adventure Team can provide a range of themed team-building activities, including raft building, archery and laser pigeon shooting. Try a trip to the Guildhall, home to one of Ireland's largest collections of stained glass, where delegates will be welcomed by the mayor before enjoying a candlelit meal. For fine dining in the heart of the historic walled city, try Mange 2, where a French-inspired menu uses fresh local produce. Spice Restaurant also promises local, seasonal fare and can be booked for corporate events. The Everglades Hotel's Satchmo's Restaurant offers gourmet cuisine on the outskirts of the city.